That’s the question Canadian teachers will soon be asking kids in grade-school. My key message to students is that I was censored because I promoted policies that were different from the Harper government’s. I do not believe that art has to agree with government policies. If it does, then art is government propaganda. 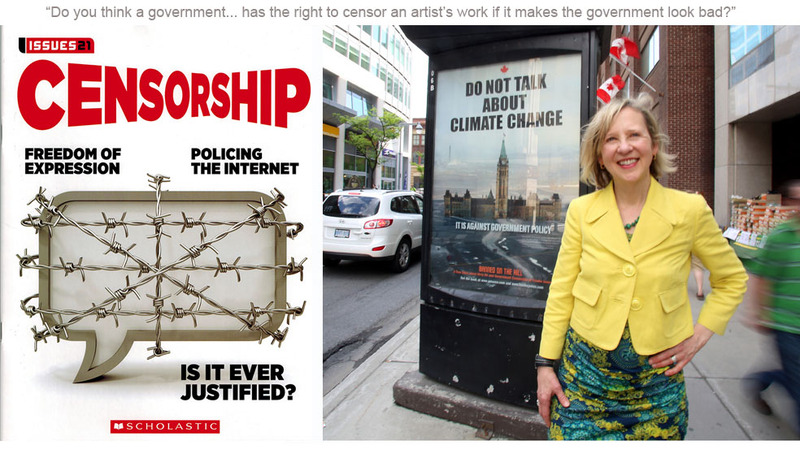 This new book “CENSORSHIP” should be recommended reading for all Members of Parliament and all Canadian bureaucrats. 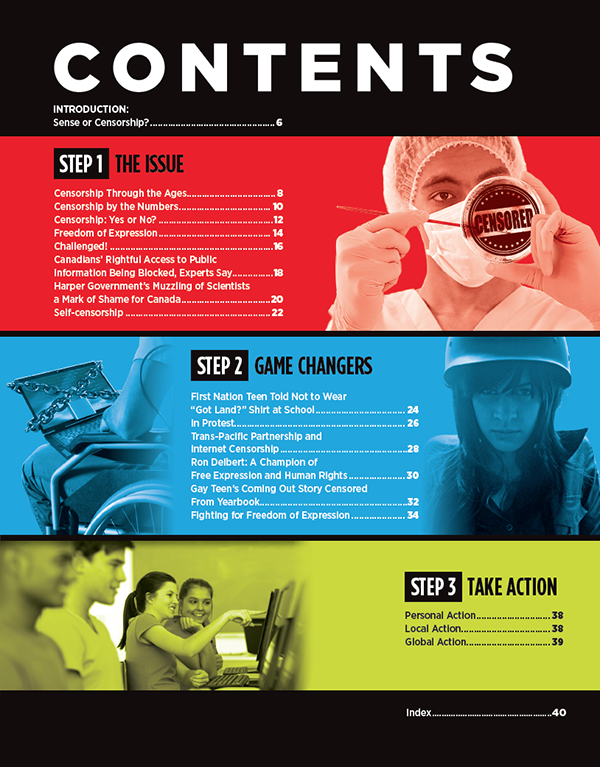 Issues 21: CENSORSHIP is focused on freedom of expression and policing the Internet. 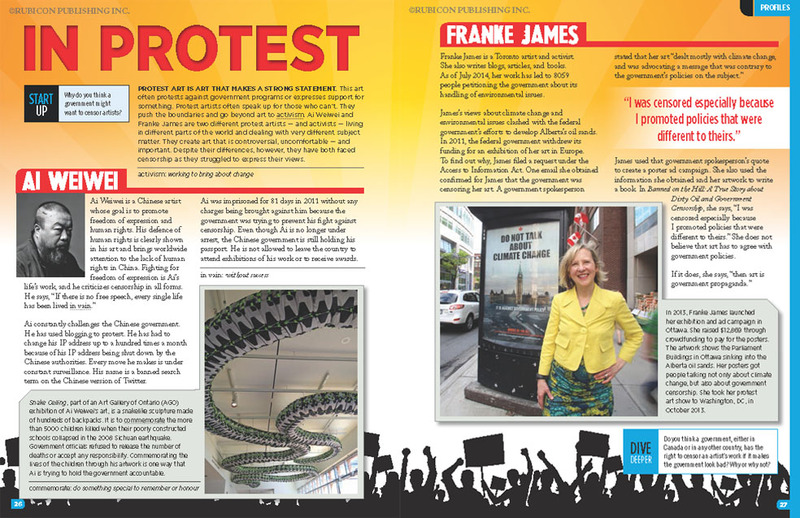 My experience of being censored by the Harper government is featured in the “Game Changers” section under the title “In Protest”. I am honoured to be sharing the spread with the Chinese artist Ai Weiwei. Amazing what Canada and China have in common these days! 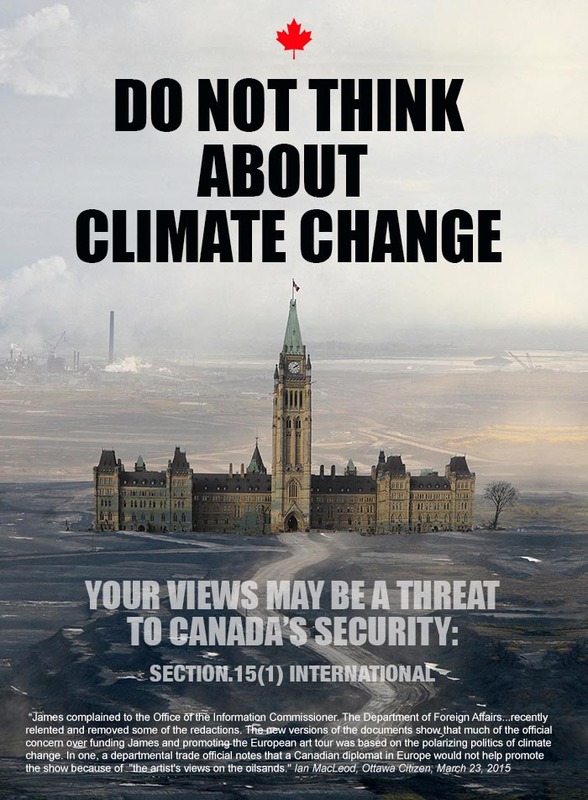 “Due to controversial views on energy issues, particularly on oil sands, the government had been wrongly applying these high level security clauses. It was to black out, redact material which was embarrassing to the government, and which was partisan,” [James] says. Media Campaign: Crowdfunding Puts Do Not Talk Posters Up in Ottawa, Calgary and Halifax. I love both the book and the idea of introducing the notion of censorship to young students in grades 6-9. Is there a plan to also introduce it to grades 10-12 as well? They will reach voting age in a few short years. Harper and his ilk can’t be gone soon enough. His wife is supposedly a lover of art and creates art. I’d love to know her opinion about art censorship. We never hear opinions about any thing. Wow what a surprise…not.